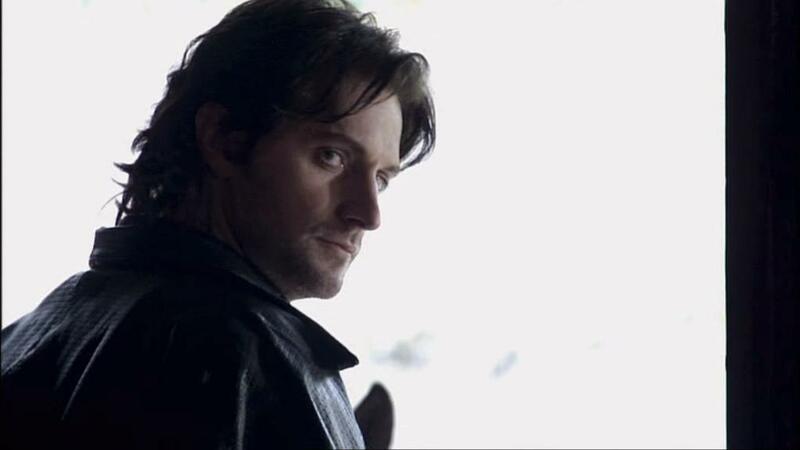 We are now on day 11 of our 12-day celebration of Richard Armitage as Guy of Gisborne. Today’s screencap was suggested by judiang. Her image comes from Robin Hood season 1 episode 5. Judiang also included the brilliant caption “Doing the Guy Flounce” which I incorporated into our Flash animation. Please be sure to visit Judiang’s blog. She talks about Richard Armitage and more! By the way, I’m looking for more captions to add to this Flash animation. Please make your suggestions in the comments box! At the moment, the captions are simply numbers except for judiang’s suggestion. EDIT: You can submit multiple captions and I will choose one! EDIT: All the captions are complete. Whew, that was fun! Thank you very much to those of you who submitted. For those of you who couldn’t think straight, I know exactly how you feel. 😉 That’s why I cried out for help, LOL! Hope you enjoy this tasty treat. See you tomorrow! 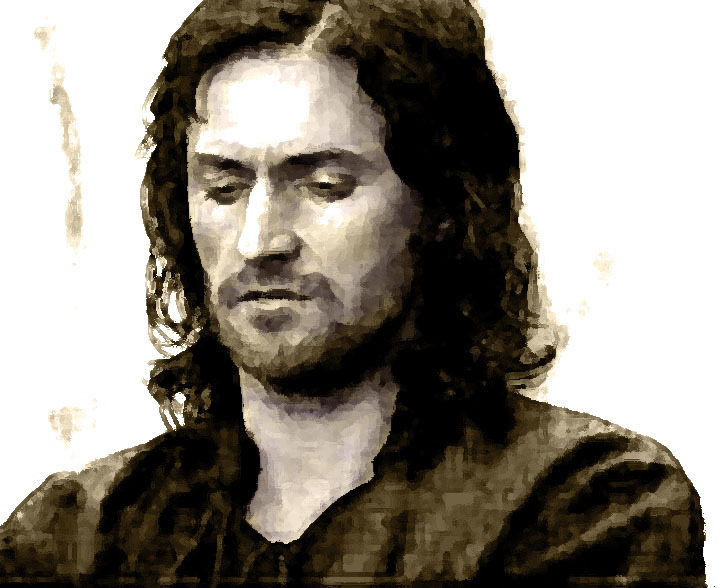 This entry was posted in Animated GIFs, Fan Videos, Graphics, richard armitage and tagged animated gifs, graphics, guy of gisborne, richard armitage, richardarmitagenet, richardarmitagenet.com, richardarmitagenetdotcom, robin hood. Bookmark the permalink. @Jane Noble: He truly is a feast for all the senses! 😛 Please let me know if you have a caption suggestion too. 🙂 Thanks for your lovely comment! Yummmmy! Love it – Of course I must say number 8: “My Lady”, and number 14: doing the SMIRK. @IngeD3: Thanks! Your caption has been added! Okay, number 3 speaks for itself all the while leaving us speechless. I must congratulate you though. Usually when you get a box of candy, there is always at least 1 piece that is just gross. I did not have that experience AT ALL with your Guy Candy!! 😉 Plus you are a just a freakin flash genius!! @trlibhart: Ah I agree about #3. 😉 Yes, there really isn’t a bad Guy candy in the bunch. He’s too delicious, YUM YUM! As this sad/sweet song says: “I’m lost for words”…. It seems to me the song is thoroughly appropriate to Guy’s situation: betrayal, forgiveness, starting a new page together? Is it the right interpretation? Yum! Who would have thought that chocolate could be so delicious and non-fattening. Thank you for the tasty treat! @Ana Cristina: Thanks very much for your caption and your comment! Your suggestion has now been added to screencap #16! You clever girl – how you manipulated Sir Guy to shake his truffle to the music when I click the top-row-second-from-right. Brilliant Bccmee. It’s the most delicious chocolates I’ve ever tasted. Phew a stressful afternoon…laptop playing up…I thought I was going to miss this one…Brill suggestions so far…what about no.4 …. you’re on fire baby!!! a card would be great…it’s driving me cRAzy…it’s jumping up and down at the moment…I think it’s just too excited…maybe if I jump up and down with it I may not notice…. LMAO – love your suggestion for # 13. Also love your # 4 – I burst out laughing when I just saw it! Fantastic flash, bcc, and excellent captions, ladies!!! @judiang, I like your screen cap choice and the “flounce” idea. Bccmee, you’ve done such a brilliant job with the flash animation that I would like a box of the following mixture: half the box is #4 and the other half is #6. A suggestion for a caption for #6 “You complete me”. A bit serious, I know, but he looks sweet and serious in this shot. Happy Sunday everyone! @Elaine: I’ll place your chocolate order directly. Thanks very much for your excellent caption suggestion. Serious is good too! Your #6 is now posted! Another fun game! Thanx Bccmee! And thanx for posting my attempt to create art LoL. But he looks good on the xmas card! Just a few ideas, 5: Would you like to dance in the dark? 7:Kissing under the mistletoe perhaps? 13: I’m more juicy than that apple. I’ve seen cakes at the bakery with pictures on it.. Maybe an idea for Xmas to give away? -cakes with a guy pic I mean- 😉 Than you can really eat him! #9 – My kingdom for a horse! #5 – I’ve caught my spur on the carpet! #7 – Maybe this time I’ll get lucky! @phylly3: LOL! Glad you found your dream come true, at least in electronic form. 😉 Thanks for all your caption ideas. I chose your #9 and it’s now posted on the Flash animation. #13 – Just checking Marian’s hair for daggers! Guy plus chocolates! How could you go wrong with that combination? He has a voice like melted chocolate does he not? This is what I would call “TEMPTATION”!!!!!!!!!!!!!!!! @Teuchter: Guy has the best low voice, yummy! LOL re: temptation! How about using it for # 5 instead? What a mouthwatering combination!!!!! It seems I can never get enough of both… lol… Loved it… n. 6… what are these eyes!!! @Luciana: I know what you mean. I don’t have any candy in the house so I had a cup of hot chocolate. 🙂 Yes, those eyes in #6 are captivating! Very tasty indeed! Captions- who cant think of anything but drizzling warm chocolate over that man’s torso and….oops did I say that out loud? I would gladly give in to this tempting man!! I don’t know if it is appropriate, sorry! Fantastic! A box of 16 delicious Guy! You are so generous! What a nice way to get back online for me, Bccmee! Sir Guy and chocolate? My endorphins are on overload! Ha! And what a sweet surprise each of those Sir Guy chocolates were! Sighhhh! @Gratiana Lovelace: Welcome back online! *HUGS* Funny you should mention the Forrest Gump line. For the heading on our Flash animation, I actually considered “Guy is Like a Box of Chocolates” but decided on something shorter. 🙂 Great minds, eh? The Ministry of Health warns: chocolates ,Guy and BCC blog are good for health! Wow! Everything’s perfect about this Flash animation, Bccmee!!! It’s really fun and delicious. Guy + chocolate + Snow Patrol = mesmerizing experience. It couldn’t be better! =))) I really loved it!!! @Thais: Oh I’m so glad you liked it! Thanks very much for your comment and continued support! Oh, please tell us you’ve got more Guy-liciousness in store for us after Day #12! You’re the best! @Monica: Oh I have a few ideas…. 😀 But I won’t be posting daily. See you soon! Thanks very much for your supportive comment. ..”you are simply the best”…. (I’m singing here:)!